For other uses, see Loudspeaker (disambiguation). The hole below the lowest woofer is a port for a bass reflex system. Midwoofers are isolated from the rest of the cabinet in perforated, cardioid chambers to create a cardioic dispersion pattern that reduces the midrange reflections. A loudspeaker (or loud-speaker or speaker) is an electroacoustic transducer; a device which converts an electrical audio signal into a corresponding sound. The most widely used type of speaker in the 2010s is the dynamic speaker, invented in 1925 by Edward W. Kellogg and Chester W. Rice. The dynamic speaker operates on the same basic principle as a dynamic microphone, but in reverse, to produce sound from an electrical signal. When an alternating current electrical audio signal is applied to its voice coil, a coil of wire suspended in a circular gap between the poles of a permanent magnet, the coil is forced to move rapidly back and forth due to Faraday's law of induction, which causes a diaphragm (usually conically shaped) attached to the coil to move back and forth, pushing on the air to create sound waves. Besides this most common method, there are several alternative technologies that can be used to convert an electrical signal into sound. The sound source (e.g., a sound recording or a microphone) must be amplified or strengthened with an audio power amplifier before the signal is sent to the speaker. Speakers are typically housed in a speaker enclosure or speaker cabinet which is often a rectangular or square box made of wood or sometimes plastic. The enclosure's materials and design play an important role in the quality of the sound. Where high fidelity reproduction of sound is required, multiple loudspeaker transducers are often mounted in the same enclosure, each reproducing a part of the audible frequency range (picture at right). In this case the individual speakers are referred to as "drivers" and the entire unit is called a loudspeaker. Drivers made for reproducing high audio frequencies are called tweeters, those for middle frequencies are called mid-range drivers, and those for low frequencies are called woofers. Smaller loudspeakers are found in devices such as radios, televisions, portable audio players, computers, and electronic musical instruments. Larger loudspeaker systems are used for music, sound reinforcement in theatres and concerts, and in public address systems. The term "loudspeaker" may refer to individual transducers (also known as "drivers") or to complete speaker systems consisting of an enclosure including one or more drivers. To adequately reproduce a wide range of frequencies with even coverage, most loudspeaker systems employ more than one driver, particularly for higher sound pressure level or maximum accuracy. Individual drivers are used to reproduce different frequency ranges. The drivers are named subwoofers (for very low frequencies); woofers (low frequencies); mid-range speakers (middle frequencies); tweeters (high frequencies); and sometimes supertweeters, optimized for the highest audible frequencies. The terms for different speaker drivers differ, depending on the application. In two-way systems there is no mid-range driver, so the task of reproducing the mid-range sounds falls upon the woofer and tweeter. Home stereos use the designation "tweeter" for the high frequency driver, while professional concert systems may designate them as "HF" or "highs". When multiple drivers are used in a system, a "filter network", called a crossover, separates the incoming signal into different frequency ranges and routes them to the appropriate driver. A loudspeaker system with n separate frequency bands is described as "n-way speakers": a two-way system will have a woofer and a tweeter; a three-way system employs a woofer, a mid-range, and a tweeter. Loudspeaker driver of the type pictured are termed "dynamic" (short for electrodynamic) to distinguish them from earlier drivers (i.e., moving iron speaker), or speakers using piezoelectric or electrostatic systems, or any of several other sorts. 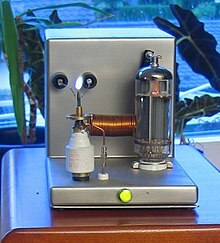 The moving-coil principle commonly used today in speakers was patented in 1924 by Chester W. Rice and Edward W. Kellogg. The key difference between previous attempts and the patent by Rice and Kellogg is the adjustment of mechanical parameters so that the fundamental resonance of the moving system is below the frequency where the cone's radiation impedance becomes uniform. 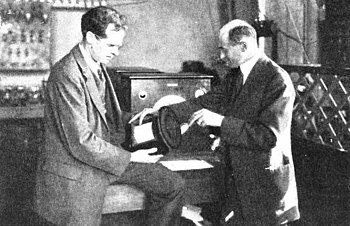 About this same period, Walter H. Schottky invented the first ribbon loudspeaker together with Dr. Erwin Gerlach. In the 1930s, loudspeaker manufacturers began to combine two and three bandpasses' worth of drivers in order to increase frequency response and sound pressure level. 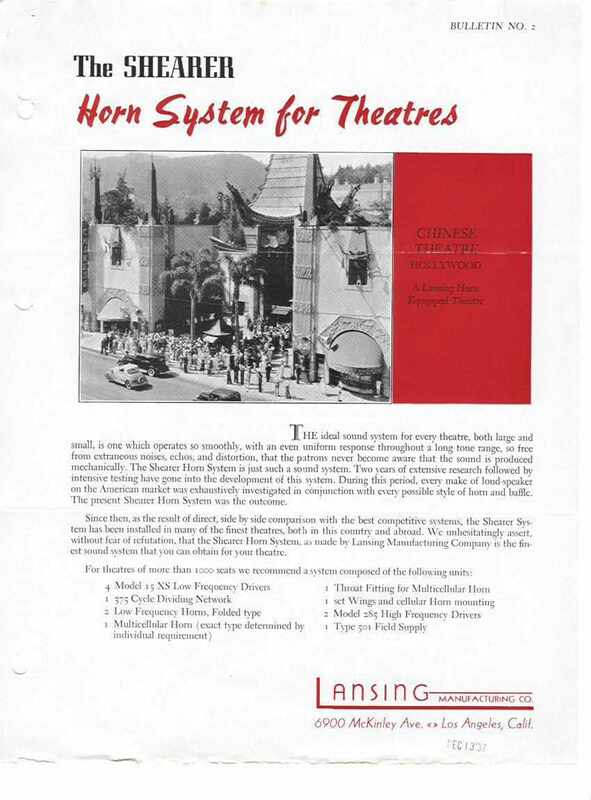 In 1937, the first film industry-standard loudspeaker system, "The Shearer Horn System for Theatres" (a two-way system), was introduced by Metro-Goldwyn-Mayer. It used four 15″ low-frequency drivers, a crossover network set for 375 Hz, and a single multi-cellular horn with two compression drivers providing the high frequencies. John Kenneth Hilliard, James Bullough Lansing, and Douglas Shearer all played roles in creating the system. At the 1939 New York World's Fair, a very large two-way public address system was mounted on a tower at Flushing Meadows. The eight 27″ low-frequency drivers were designed by Rudy Bozak in his role as chief engineer for Cinaudagraph. High-frequency drivers were likely made by Western Electric. 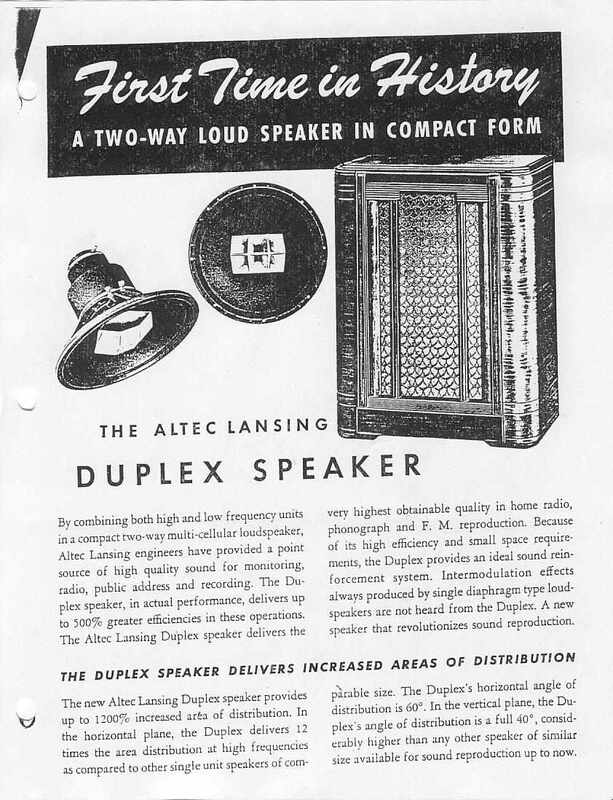 Altec Lansing introduced the 604, which became their most famous coaxial Duplex driver, in 1943. It incorporated a high-frequency horn that sent sound through the middle of a 15-inch woofer for near-point-source performance. Altec's "Voice of the Theatre" loudspeaker system arrived in the marketplace in 1945, offering better coherence and clarity at the high output levels necessary in movie theaters. The Academy of Motion Picture Arts and Sciences immediately began testing its sonic characteristics; they made it the film house industry standard in 1955. Cutaway view of a dynamic loudspeaker for the bass register. Cutaway view of a dynamic midrange speaker. Cutaway view of a dynamic tweeter with acoustic lens and a dome-shaped membrane. 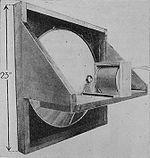 The most common type of driver, commonly called a dynamic loudspeaker, uses a lightweight diaphragm, or cone, connected to a rigid basket, or frame, via a flexible suspension, commonly called a spider, that constrains a voice coil to move axially through a cylindrical magnetic gap. When an electrical signal is applied to the voice coil, a magnetic field is created by the electric current in the voice coil, making it a variable electromagnet. The coil and the driver's magnetic system interact, generating a mechanical force that causes the coil (and thus, the attached cone) to move back and forth, accelerating and reproducing sound under the control of the applied electrical signal coming from the amplifier. The following is a description of the individual components of this type of loudspeaker. The diaphragm is usually manufactured with a cone- or dome-shaped profile. A variety of different materials may be used, but the most common are paper, plastic, and metal. The ideal material would 1) be rigid, to prevent uncontrolled cone motions; 2) have low mass, to minimize starting force requirements and energy storage issues; 3) be well damped, to reduce vibrations continuing after the signal has stopped with little or no audible ringing due to its resonance frequency as determined by its usage. In practice, all three of these criteria cannot be met simultaneously using existing materials; thus, driver design involves trade-offs. For example, paper is light and typically well damped, but is not stiff; metal may be stiff and light, but it usually has poor damping; plastic can be light, but typically, the stiffer it is made, the poorer the damping. As a result, many cones are made of some sort of composite material. For example, a cone might be made of cellulose paper, into which some carbon fiber, Kevlar, glass, hemp or bamboo fibers have been added; or it might use a honeycomb sandwich construction; or a coating might be applied to it so as to provide additional stiffening or damping. The chassis, frame, or basket, is designed to be rigid, avoiding deformation that could change critical alignments with the magnet gap, perhaps causing the voice coil to rub against the sides of the gap. Chassis are typically cast from aluminum alloy, or stamped from thin steel sheet, though in some drivers with large magnets cast chassis are preferable as sheet metal can easily be warped in whenever the loudspeaker is subjected to rough handling. Other materials such as molded plastic and damped plastic compound baskets are becoming common, especially for inexpensive, low-mass drivers. Metallic chassis can play an important role in conducting heat away from the voice coil; heating during operation changes resistance, causes physical dimensional changes, and if extreme, may even demagnetize permanent magnets. The suspension system keeps the coil centered in the gap and provides a restoring (centering) force that returns the cone to a neutral position after moving. A typical suspension system consists of two parts: the spider, which connects the diaphragm or voice coil to the frame and provides the majority of the restoring force, and the surround, which helps center the coil/cone assembly and allows free pistonic motion aligned with the magnetic gap. The spider is usually made of a corrugated fabric disk, impregnated with a stiffening resin. The name comes from the shape of early suspensions, which were two concentric rings of Bakelite material, joined by six or eight curved "legs." Variations of this topology included the addition of a felt disc to provide a barrier to particles that might otherwise cause the voice coil to rub. The German firm Rulik still offers drivers with uncommon spiders made of wood. The cone surround can be rubber or polyester foam, or a ring of corrugated, resin coated fabric; it is attached to both the outer diaphragm circumference and to the frame. These diverse surround materials, their shape and treatment can dramatically affect the acoustic output of a driver; each implementation having advantages and disadvantages. Polyester foam, for example, is lightweight and economical, though usually leaking air to some degree, but is degraded by exposure to ozone, UV light, humidity and elevated temperatures, significantly limiting useful life with adequate performance. The wire in a voice coil is usually made of copper, though aluminum—and, rarely, silver—may be used. The advantage of aluminum is its light weight, which reduces the moving mass compared to copper. This raises the resonant frequency of the speaker and increases its efficiency. A disadvantage of aluminum is that it is not easily soldered, and so connections are instead often crimped together and sealed. These connections must be made well or they may fail in an intense environment of mechanical vibration. Voice-coil wire cross sections can be circular, rectangular, or hexagonal, giving varying amounts of wire volume coverage in the magnetic gap space. The coil is oriented co-axially inside the gap; it moves back and forth within a small circular volume (a hole, slot, or groove) in the magnetic structure. The gap establishes a concentrated magnetic field between the two poles of a permanent magnet; the outside of the gap being one pole, and the center post (called the pole piece) being the other. The pole piece and backplate are often a single piece, called the poleplate or yoke. Modern driver magnets are almost always permanent and made of ceramic, ferrite, alnico, or, more recently, rare earth such as neodymium and samarium cobalt. Electrodynamic drivers were often used in musical instrument amplifier/speaker cabinets well into the 1950s; there were economic savings in those using tube amplifiers as the field coil could, and usually did, do double duty as a power supply choke. A trend in design — due to increases in transportation costs and a desire for smaller, lighter devices (as in many home theater multi-speaker installations) — is the use of the last instead of heavier ferrite types. Very few manufacturers still produce electrodynamic loudspeakers with electrically powered field coils, as was common in the earliest designs; one of the last is a French firm. When high field-strength permanent magnets became available after WWII, alnico, an alloy of aluminum, nickel, and cobalt became popular, since it dispensed with the problems of field-coil drivers. Alnico was used almost exclusively until about 1980, despite the embarrassing problem of alnico magnets being partially degaussed (i.e., demagnetized) by accidental 'pops' or 'clicks' caused by loose connections, especially if used with a high-power amplifier. The damage can be reversed by "recharging" the magnet, but this requires uncommon specialist equipment and knowledge. After 1980, most (but not quite all) driver manufacturers switched from alnico to ferrite magnets, which are made from a mix of ceramic clay and fine particles of barium or strontium ferrite. Although the energy per kilogram of these ceramic magnets is lower than alnico, it is substantially less expensive, allowing designers to use larger yet more economical magnets to achieve a given performance. The size and type of magnet and details of the magnetic circuit differ, depending on design goals. For instance, the shape of the pole piece affects the magnetic interaction between the voice coil and the magnetic field, and is sometimes used to modify a driver's behavior. A "shorting ring", or Faraday loop, may be included as a thin copper cap fitted over the pole tip or as a heavy ring situated within the magnet-pole cavity. The benefits of this complication is reduced impedance at high frequencies, providing extended treble output, reduced harmonic distortion, and a reduction in the inductance modulation that typically accompanies large voice coil excursions. On the other hand, the copper cap requires a wider voice-coil gap, with increased magnetic reluctance; this reduces available flux, requiring a larger magnet for equivalent performance. Driver design—including the particular way two or more drivers are combined in an enclosure to make a speaker system—is both an art, involving subjective perceptions of timbre and sound quality and a science, involving measurements and experiments. Adjusting a design to improve performance is done using a combination of magnetic, acoustic, mechanical, electrical, and material science theory, and tracked with high precision measurements and the observations of experienced listeners. A few of the issues speaker and driver designers must confront are distortion, radiation lobing, phase effects, off-axis response, and crossover artifacts. Designers can use an anechoic chamber to ensure the speaker can be measured independently of room effects, or any of several electronic techniques that, to some extent, substitute for such chambers. Some developers eschew anechoic chambers in favor of specific standardized room setups intended to simulate real-life listening conditions. Fabrication of finished loudspeaker systems has become segmented, depending largely on price, shipping costs, and weight limitations. High-end speaker systems, which are typically heavier (and often larger) than economic shipping allows outside local regions, are usually made in their target market region and can cost $140,000 or more per pair. Economical mass market speaker systems and drivers available for much lower costs may be manufactured in China or other low-cost manufacturing locations. Individual electrodynamic drivers provide their best performance within a limited frequency range. Multiple drivers (e.g., subwoofers, woofers, mid-range drivers, and tweeters) are generally combined into a complete loudspeaker system to provide performance beyond that constraint. 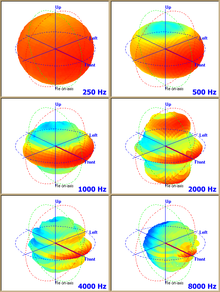 The three most commonly used sound radiation systems are the cone, dome and horn type drivers. A full-range driver is a speaker designed to be used alone to reproduce an audio channel without the help of other drivers, and therefore must cover the entire audio frequency range. These drivers are small, typically 3 to 8 inches (7.6 to 20.3 cm) in diameter to permit reasonable high frequency response, and carefully designed to give low-distortion output at low frequencies, though with reduced maximum output level. Full-range (or more accurately, wide-range) drivers are most commonly heard in public address systems, in televisions (although some models are suitable for hi-fi listening), small radios, intercoms, some computer speakers, etc. In hi-fi speaker systems, the use of wide-range drive units can avoid undesirable interactions between multiple drivers caused by non-coincident driver location or crossover network issues. Fans of wide-range driver hi-fi speaker systems claim a coherence of sound due to the single source and a resulting lack of interference, and likely also to the lack of crossover components. Detractors typically cite wide-range drivers' limited frequency response and modest output abilities (most especially at low frequencies), together with their requirement for large, elaborate, expensive enclosures—such as transmission lines, quarter wave resonators or horns—to approach optimum performance. With the advent of neodymium drivers, low-cost quarter-wave transmission lines are made possible and are increasingly made availably commercially. Full-range drivers often employ an additional cone called a whizzer: a small, light cone attached to the joint between the voice coil and the primary cone. The whizzer cone extends the high-frequency response of the driver and broadens its high frequency directivity, which would otherwise be greatly narrowed due to the outer diameter cone material failing to keep up with the central voice coil at higher frequencies. The main cone in a whizzer design is manufactured so as to flex more in the outer diameter than in the center. The result is that the main cone delivers low frequencies and the whizzer cone contributes most of the higher frequencies. Since the whizzer cone is smaller than the main diaphragm, output dispersion at high frequencies is improved relative to an equivalent single larger diaphragm. Limited-range drivers, also used alone, are typically found in computers, toys, and clock radios. These drivers are less elaborate and less expensive than wide-range drivers, and they may be severely compromised to fit into very small mounting locations. In these applications, sound quality is a low priority. The human ear is remarkably tolerant of poor sound quality, and the distortion inherent in limited-range drivers may enhance their output at high frequencies, increasing clarity when listening to spoken word material. A subwoofer is a woofer driver used only for the lowest-pitched part of the audio spectrum: typically below 200 Hz for consumer systems, below 100 Hz for professional live sound, and below 80 Hz in THX-approved systems. Because the intended range of frequencies is limited, subwoofer system design is usually simpler in many respects than for conventional loudspeakers, often consisting of a single driver enclosed in a suitable box or enclosure. Since sound in this frequency range can easily bend around corners by diffraction, the speaker aperture does not have to face the audience, and subwoofers can be mounted in the bottom of the enclosure, facing the floor. This is eased by the limitations of human hearing at low frequencies; such sounds cannot be located in space, due to their large wavelengths compared to higher frequencies which produce differential effects in the ears due to shadowing by the head, and diffraction around it, both of which we rely upon for localization clues. To accurately reproduce very low bass notes without unwanted resonances (typically from cabinet panels), subwoofer systems must be solidly constructed and properly braced to avoid unwanted sounds of cabinet vibrations. As a result, good subwoofers are typically quite heavy. Many subwoofer systems include integrated power amplifiers and electronic subsonic (sub)-filters, with additional controls relevant to low-frequency reproduction (e.g., a crossover knob and a phase switch). These variants are known as "active" or "powered" subwoofers, with the former including a power amplifier. In contrast, "passive" subwoofers require external amplification. In typical installations, subwoofers are physically separated from the rest of the speaker cabinets. Because of propagation delay, their output may be somewhat out of phase from another subwoofer (on another channel) or slightly out of phase with the rest of the sound. Consequently, a subwoofer's power amp often has a phase-delay adjustment (approximately 1 ms of delay is required for each additional foot of separation from the listener) which may improve performance of the system as a whole at subwoofer frequencies (and perhaps an octave or so above the crossover point). However, the influence of room resonances (sometimes called standing waves) is typically so large that such issues are secondary in practice. Subwoofers are widely used in large concert and mid-sized venue sound reinforcement systems. Subwoofer cabinets are often built with a bass reflex port (i.e., a hole cut into the cabinet with a tube attached to it), a design feature which if properly engineered improves bass performance and increases efficiency. A woofer is a driver that reproduces low frequencies. The driver works with the characteristics of the enclosure to produce suitable low frequencies (see speaker enclosure for some of the design choices available). Indeed, both are so closely connected that they must be considered together in use. Only at design time do the separate properties of enclosure and woofer matter individually. Some loudspeaker systems use a woofer for the lowest frequencies, sometimes well enough that a subwoofer is not needed. Additionally, some loudspeakers use the woofer to handle middle frequencies, eliminating the mid-range driver. This can be accomplished with the selection of a tweeter that can work low enough that, combined with a woofer that responds high enough, the two drivers add coherently in the middle frequencies. A mid-range speaker is a loudspeaker driver that reproduces a band of frequencies generally between 1–6 kHz, otherwise known as the 'mid' frequencies (between the woofer and tweeter). Mid-range driver diaphragms can be made of paper or composite materials, and can be direct radiation drivers (rather like smaller woofers) or they can be compression drivers (rather like some tweeter designs). If the mid-range driver is a direct radiator, it can be mounted on the front baffle of a loudspeaker enclosure, or, if a compression driver, mounted at the throat of a horn for added output level and control of radiation pattern. 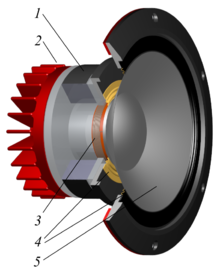 Exploded view of a dome tweeter. A tweeter is a high-frequency driver that reproduces the highest frequencies in a speaker system. A major problem in tweeter design is achieving wide angular sound coverage (off-axis response), since high frequency sound tends to leave the speaker in narrow beams. 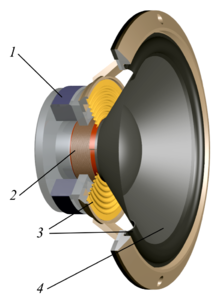 Soft-dome tweeters are widely found in home stereo systems, and horn-loaded compression drivers are common in professional sound reinforcement. Ribbon tweeters have gained popularity in recent years, as the output power of some designs has been increased to levels useful for professional sound reinforcement, and their output pattern is wide in the horizontal plane, a pattern that has convenient applications in concert sound. A coaxial driver is a loudspeaker driver with two or several combined concentric drivers. Coaxial drivers have been produced by many companies, such as Altec, Tannoy, Pioneer, KEF, SEAS, B&C Speakers, BMS, Cabasse and Genelec. Used in multi-driver speaker systems, the crossover is an assembly of filters that separate the input signal into different frequency ranges (i.e. "bands"), according to the requirements of each driver. Hence the drivers receive power only at their operating frequency (the sound frequency range they were designed for), thereby reducing distortion in the drivers and interference between them. The ideal characteristics of a crossover may include perfect out-of-band attenuation at the output of each filter, no amplitude variation ("ripple") within each passband, no phase delay between overlapping frequency bands, to name just a few. Crossovers can be passive or active. A passive crossover is an electronic circuit that uses a combination of one or more resistors, inductors, or non-polar capacitors. These components are combined to form a filter network and are most often placed between the full frequency-range power amplifier and the loudspeaker drivers to divide the amplifier's signal into the necessary frequency bands before being delivered to the individual drivers. Passive crossover circuits need no external power beyond the audio signal itself, but have some disadvantages: they may require larger inductors and capacitors due to power handling requirements (being driven by the amplifier), limited component availability to optimize the crossover's characteristics at such power levels, etc. Unlike active crossovers which include a built-in amplifier, passive crossovers have an inherent attenuation within the passband, typically leading to a reduction in damping factor before the voice coil  An active crossover is an electronic filter circuit that divides the signal into individual frequency bands before power amplification, thus requiring at least one power amplifier for each bandpass. Passive filtering may also be used in this way before power amplification, but it is an uncommon solution, being less flexible than active filtering. Any technique that uses crossover filtering followed by amplification is commonly known as bi-amping, tri-amping, quad-amping, and so on, depending on the minimum number of amplifier channels. Some loudspeaker designs use a combination of passive and active crossover filtering, such as a passive crossover between the mid- and high-frequency drivers and an active crossover between the low-frequency driver and the combined mid- and high frequencies. Passive crossovers are commonly installed inside speaker boxes and are by far the most usual type of crossover for home and low-power use. In car audio systems, passive crossovers may be in a separate box, necessary to accommodate the size of the components used. Passive crossovers may be simple for low-order filtering, or complex to allow steep slopes such as 18 or 24 dB per octave. Passive crossovers can also be designed to compensate for undesired characteristics of driver, horn, or enclosure resonances, and can be tricky to implement, due to component interaction. Passive crossovers, like the driver units that they feed, have power handling limits, have insertion losses (10% is often claimed), and change the load seen by the amplifier. The changes are matters of concern for many in the hi-fi world. When high output levels are required, active crossovers may be preferable. Active crossovers may be simple circuits that emulate the response of a passive network, or may be more complex, allowing extensive audio adjustments. Some active crossovers, usually digital loudspeaker management systems, may include electronics and controls for precise alignment of phase and time between frequency bands, equalization, dynamic range compression and limiting) control. An unusual three-way speaker system. The cabinet is narrow to raise the frequency where a diffraction effect called the "baffle step" occurs. Most loudspeaker systems consist of drivers mounted in an enclosure, or cabinet. The role of the enclosure is to prevent sound waves emanating from the back of a driver from interfering destructively with those from the front. The sound waves emitted from the back are 180° out of phase with those emitted forward, so without an enclosure they typically cause cancellations which significantly degrade the level and quality of sound at low frequencies. The simplest driver mount is a flat panel (i.e., baffle) with the drivers mounted in holes in it. However, in this approach, sound frequencies with a wavelength longer than the baffle dimensions are canceled out, because the antiphase radiation from the rear of the cone interferes with the radiation from the front. With an infinitely large panel, this interference could be entirely prevented. A sufficiently large sealed box can approach this behavior. Since panels of infinite dimensions are impossible, most enclosures function by containing the rear radiation from the moving diaphragm. A sealed enclosure prevents transmission of the sound emitted from the rear of the loudspeaker by confining the sound in a rigid and airtight box. Techniques used to reduce transmission of sound through the walls of the cabinet include thicker cabinet walls, lossy wall material, internal bracing, curved cabinet walls—or more rarely, visco-elastic materials (e.g., mineral-loaded bitumen) or thin lead sheeting applied to the interior enclosure walls. However, a rigid enclosure reflects sound internally, which can then be transmitted back through the loudspeaker diaphragm—again resulting in degradation of sound quality. This can be reduced by internal absorption using absorptive materials (often called "damping"), such as glass wool, wool, or synthetic fiber batting, within the enclosure. The internal shape of the enclosure can also be designed to reduce this by reflecting sounds away from the loudspeaker diaphragm, where they may then be absorbed. Other enclosure types alter the rear sound radiation so it can add constructively to the output from the front of the cone. Designs that do this (including bass reflex, passive radiator, transmission line, etc.) are often used to extend the effective low-frequency response and increase low-frequency output of the driver. To make the transition between drivers as seamless as possible, system designers have attempted to time-align (or phase adjust) the drivers by moving one or more driver mounting locations forward or back so that the acoustic center of each driver is in the same vertical plane. This may also involve tilting the face speaker back, providing a separate enclosure mounting for each driver, or (less commonly) using electronic techniques to achieve the same effect. These attempts have resulted in some unusual cabinet designs. The speaker mounting scheme (including cabinets) can also cause diffraction, resulting in peaks and dips in the frequency response. The problem is usually greatest at higher frequencies, where wavelengths are similar to, or smaller than, cabinet dimensions. The effect can be minimized by rounding the front edges of the cabinet, curving the cabinet itself, using a smaller or narrower enclosure, choosing a strategic driver arrangement, using absorptive material around a driver, or some combination of these and other schemes. Horn loudspeakers are the oldest form of loudspeaker system. 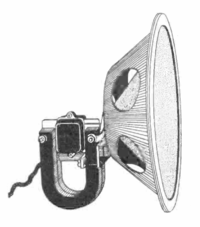 The use of horns as voice-amplifying megaphones dates at least to the 17th century, and horns were used in mechanical gramophones as early as 1857. Horn loudspeakers use a shaped waveguide in front of or behind the driver to increase the directivity of the loudspeaker and to transform a small diameter, high pressure condition at the driver cone surface to a large diameter, low pressure condition at the mouth of the horn. This improves the acoustic—electro/mechanical impedance match between the driver and ambient air, increasing efficiency, and focusing the sound over a narrower area. The size of the throat, mouth, the length of the horn, as well as the area expansion rate along it must be carefully chosen to match the drive to properly provide this transforming function over a range of frequencies (every horn performs poorly outside its acoustic limits, at both high and low frequencies). The length and cross-sectional mouth area required to create a bass or sub-bass horn require a horn many feet long. 'Folded' horns can reduce the total size, but compel designers to make compromises and accept increased complication such as cost and construction. Some horn designs not only fold the low frequency horn, but use the walls in a room corner as an extension of the horn mouth. In the late 1940s, horns whose mouths took up much of a room wall were not unknown amongst hi-fi fans. Room sized installations became much less acceptable when two or more were required. A horn loaded speaker can have a sensitivity as high as 110 dB at 2.83 volts (1 watt at 8 ohms) at 1 meter. This is a hundredfold increase in output compared to a speaker rated at 90 dB sensitivity, and is invaluable in applications where high sound levels are required or amplifier power is limited. 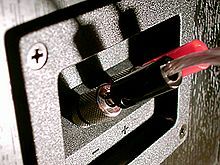 Two-way binding posts on a loudspeaker, connected using banana plugs. A 4-ohm loudspeaker with two pairs of binding posts capable of accepting bi-wiring after the removal of two metal straps. 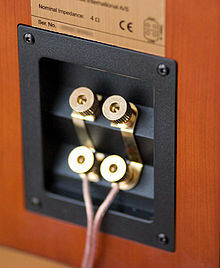 Most home hi-fi loudspeakers use two wiring points to connect to the source of the signal (for example, to the audio amplifier or receiver). To accept the wire connection, the loudspeaker enclosure may have binding posts, spring clips, or a panel-mount jack. If the wires for a pair of speakers are not connected with respect to the proper electrical polarity (the + and − connections on the speaker and amplifier should be connected + to + and − to −; speaker cable is almost always marked so that one conductor of a pair can be distinguished from the other, even if it has run under or behind things in its run from amplifier to speaker location), the loudspeakers are said to be "out of phase" or more properly "out of polarity". Given identical signals, motion in one cone is in the opposite direction of the other. This typically causes monophonic material in a stereo recording to be canceled out, reduced in level, and made more difficult to localize, all due to destructive interference of the sound waves. The cancellation effect is most noticeable at frequencies where the loudspeakers are separated by a quarter wavelength or less; low frequencies are affected the most. This type of miswiring error does not damage speakers, but is not optimal for listening. With sound reinforcement system, PA system and instrument amplifier speaker enclosures, cables and some type of jack or connector are typically used. Lower- and mid-priced sound system and instrument speaker cabinets often use 1/4" speaker cable jacks. Higher-priced and higher powered sound system cabinets and instrument speaker cabinets often use Speakon connectors. Speakon connectors are considered to be safer for high wattage amplifiers, because the connector is designed so that human users cannot touch the connectors. Wireless speakers are very similar to traditional (wired) loudspeakers, but they receive audio signals using radio frequency (RF) waves rather than over audio cables. There is normally an amplifier integrated in the speaker's cabinet because the RF waves alone are not enough to drive the speaker. This integration of amplifier and loudspeaker is known as an active loudspeaker. Manufacturers of these loudspeakers design them to be as lightweight as possible while producing the maximum amount of audio output efficiency. Wireless speakers still need power, so require a nearby AC power outlet, or possibly batteries. Only the wire to the amplifier is eliminated. 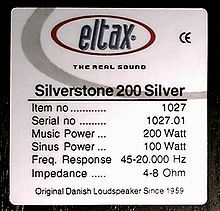 Specifications label on a loudspeaker. Speaker or driver type (individual units only) – Full-range, woofer, tweeter, or mid-range. Size of individual drivers. For cone drivers, the quoted size is generally the outside diameter of the basket. However, it may less commonly also be the diameter of the cone surround, measured apex to apex, or the distance from the center of one mounting hole to its opposite. Voice-coil diameter may also be specified. If the loudspeaker has a compression horn driver, the diameter of the horn throat may be given. Rated Power – Nominal (or even continuous) power, and peak (or maximum short-term) power a loudspeaker can handle (i.e., maximum input power before destroying the loudspeaker; it is never the sound output the loudspeaker produces). A driver may be damaged at much less than its rated power if driven past its mechanical limits at lower frequencies. Tweeters can also be damaged by amplifier clipping (amplifier circuits produce large amounts of energy at high frequencies in such cases) or by music or sine wave input at high frequencies. Each of these situations might pass more energy to a tweeter than it can survive without damage. In some jurisdictions, power handling has a legal meaning allowing comparisons between loudspeakers under consideration. Elsewhere, the variety of meanings for power handling capacity can be quite confusing. Impedance – typically 4 Ω (ohms), 8 Ω, etc. Baffle or enclosure type (enclosed systems only) – Sealed, bass reflex, etc. Number of drivers (complete speaker systems only) – two-way, three-way, etc. Crossover frequency(ies) (multi-driver systems only) – The nominal frequency boundaries of the division between drivers. Frequency response – The measured, or specified, output over a specified range of frequencies for a constant input level varied across those frequencies. It sometimes includes a variance limit, such as within "± 2.5 dB." Thiele/Small parameters (individual drivers only) – these include the driver's Fs (resonance frequency), Qts (a driver's Q; more or less, its damping factor at resonant frequency), Vas (the equivalent air compliance volume of the driver), etc. Sensitivity – The sound pressure level produced by a loudspeaker in a non-reverberant environment, often specified in dB and measured at 1 meter with an input of 1 watt (2.83 rms volts into 8 Ω), typically at one or more specified frequencies. Manufacturers often use this rating in marketing material. Maximum sound pressure level – The highest output the loudspeaker can manage, short of damage or not exceeding a particular distortion level. Manufacturers often use this rating in marketing material—commonly without reference to frequency range or distortion level. The load that a driver presents to an amplifier consists of a complex electrical impedance—a combination of resistance and both capacitive and inductive reactance, which combines properties of the driver, its mechanical motion, the effects of crossover components (if any are in the signal path between amplifier and driver), and the effects of air loading on the driver as modified by the enclosure and its environment. Most amplifiers' output specifications are given at a specific power into an ideal resistive load; however, a loudspeaker does not have a constant impedance across its frequency range. Instead, the voice coil is inductive, the driver has mechanical resonances, the enclosure changes the driver's electrical and mechanical characteristics, and a passive crossover between the drivers and the amplifier contributes its own variations. The result is a load impedance that varies widely with frequency, and usually a varying phase relationship between voltage and current as well, also changing with frequency. Some amplifiers can cope with the variation better than others can. To make sound, a loudspeaker is driven by modulated electric current (produced by an amplifier) that passes through a "speaker coil" which then (through inductance) creates a magnetic field around the coil, creating a magnetic field. The electric current variations that pass through the speaker are thus converted to a varying magnetic field, whose interaction with the driver's magnetic field moves the speaker diaphragm, which thus forces the driver to produce air motion that is similar to the original signal from the amplifier. Examples of typical measurements are: amplitude and phase characteristics vs. frequency; impulse response under one or more conditions (e.g., square waves, sine wave bursts, etc. ); directivity vs. frequency (e.g., horizontally, vertically, spherically, etc. ); harmonic and intermodulation distortion vs. sound pressure level (SPL) output, using any of several test signals; stored energy (i.e., ringing) at various frequencies; impedance vs. frequency; and small-signal vs. large-signal performance. Most of these measurements require sophisticated and often expensive equipment to perform, and also good judgment by the operator, but the raw sound pressure level output is rather easier to report and so is often the only specified value—sometimes in misleadingly exact terms. The sound pressure level (SPL) a loudspeaker produces is measured in decibels (dBspl). Loudspeaker efficiency is defined as the sound power output divided by the electrical power input. Most loudspeakers are inefficient transducers; only about 1% of the electrical energy sent by an amplifier to a typical home loudspeaker is converted to acoustic energy. The remainder is converted to heat, mostly in the voice coil and magnet assembly. The main reason for this is the difficulty of achieving proper impedance matching between the acoustic impedance of the drive unit and the air it radiates into. (At low frequencies, improving this match is the main purpose of speaker enclosure designs). The efficiency of loudspeaker drivers varies with frequency as well. For instance, the output of a woofer driver decreases as the input frequency decreases because of the increasingly poor match between air and the driver. Driver ratings based on the SPL for a given input are called sensitivity ratings and are notionally similar to efficiency. Sensitivity is usually defined as so many decibels at 1 W electrical input, measured at 1 meter (except for headphones), often at a single frequency. The voltage used is often 2.83 VRMS, which is 1 watt into an 8 Ω (nominal) speaker impedance (approximately true for many speaker systems). Measurements taken with this reference are quoted as dB with 2.83 V @ 1 m.
The sound pressure output is measured at (or mathematically scaled to be equivalent to a measurement taken at) one meter from the loudspeaker and on-axis (directly in front of it), under the condition that the loudspeaker is radiating into an infinitely large space and mounted on an infinite baffle. Clearly then, sensitivity does not correlate precisely with efficiency, as it also depends on the directivity of the driver being tested and the acoustic environment in front of the actual loudspeaker. For example, a cheerleader's horn produces more sound output in the direction it is pointed by concentrating sound waves from the cheerleader in one direction, thus "focusing" them. The horn also improves impedance matching between the voice and the air, which produces more acoustic power for a given speaker power. In some cases, improved impedance matching (via careful enclosure design) lets the speaker produce more acoustic power. Typical home loudspeakers have sensitivities of about 85 to 95 dB for 1 W @ 1 m—an efficiency of 0.5–4%. Sound reinforcement and public address loudspeakers have sensitivities of perhaps 95 to 102 dB for 1 W @ 1 m—an efficiency of 4–10%. Rock concert, stadium PA, marine hailing, etc. speakers generally have higher sensitivities of 103 to 110 dB for 1 W @ 1 m—an efficiency of 10–20%. A driver with a higher maximum power rating cannot necessarily be driven to louder levels than a lower-rated one, since sensitivity and power handling are largely independent properties. In the examples that follow, assume (for simplicity) that the drivers being compared have the same electrical impedance, are operated at the same frequency within both driver's respective pass bands, and that power compression and distortion are low. For the first example, a speaker 3 dB more sensitive than another produces double the sound power (is 3 dB louder) for the same power input. Thus, a 100 W driver ("A") rated at 92 dB for 1 W @ 1 m sensitivity puts out twice as much acoustic power as a 200 W driver ("B") rated at 89 dB for 1 W @ 1 m when both are driven with 100 W of input power. In this particular example, when driven at 100 W, speaker A produces the same SPL, or loudness as speaker B would produce with 200 W input. Thus, a 3 dB increase in sensitivity of the speaker means that it needs half the amplifier power to achieve a given SPL. This translates into a smaller, less complex power amplifier—and often, to reduced overall system cost. It is typically not possible to combine high efficiency (especially at low frequencies) with compact enclosure size and adequate low frequency response. One can, for the most part, choose only two of the three parameters when designing a speaker system. So, for example, if extended low-frequency performance and small box size are important, one must accept low efficiency. This rule of thumb is sometimes called Hofmann's Iron Law (after J.A. Hofmann, the "H" in KLH). The interaction of a loudspeaker system with its environment is complex and is largely out of the loudspeaker designer's control. Most listening rooms present a more or less reflective environment, depending on size, shape, volume, and furnishings. This means the sound reaching a listener's ears consists not only of sound directly from the speaker system, but also the same sound delayed by traveling to and from (and being modified by) one or more surfaces. These reflected sound waves, when added to the direct sound, cause cancellation and addition at assorted frequencies (e.g., from resonant room modes), thus changing the timbre and character of the sound at the listener's ears. The human brain is very sensitive to small variations, including some of these, and this is part of the reason why a loudspeaker system sounds different at different listening positions or in different rooms. A significant factor in the sound of a loudspeaker system is the amount of absorption and diffusion present in the environment. Clapping one's hands in a typical empty room, without draperies or carpet, produces a zippy, fluttery echo due both to a lack of absorption and to reverberation (that is, repeated echoes) from flat reflective walls, floor, and ceiling. The addition of hard surfaced furniture, wall hangings, shelving and even baroque plaster ceiling decoration changes the echoes, primarily because of diffusion caused by reflective objects with shapes and surfaces having sizes on the order of the sound wavelengths. This somewhat breaks up the simple reflections otherwise caused by bare flat surfaces, and spreads the reflected energy of an incident wave over a larger angle on reflection. In a typical rectangular listening room, the hard, parallel surfaces of the walls, floor and ceiling cause primary acoustic resonance nodes in each of the three dimensions: left-right, up-down and forward-backward. Furthermore, there are more complex resonance modes involving three, four, five and even all six boundary surfaces combining to create standing waves. Low frequencies excite these modes the most, since long wavelengths are not much affected by furniture compositions or placement. The mode spacing is critical, especially in small and medium size rooms like recording studios, home theaters and broadcast studios. The proximity of the loudspeakers to room boundaries affects how strongly the resonances are excited as well as affecting the relative strength at each frequency. The location of the listener is critical, too, as a position near a boundary can have a great effect on the perceived balance of frequencies. This is because standing wave patterns are most easily heard in these locations and at lower frequencies, below the Schroeder frequency – typically around 200–300 Hz, depending on room size. Acousticians, in studying the radiation of sound sources have developed some concepts important to understanding how loudspeakers are perceived. The simplest possible radiating source is a point source, sometimes called a simple source. An ideal point source is an infinitesimally small point radiating sound. It may be easier to imagine a tiny pulsating sphere, uniformly increasing and decreasing in diameter, sending out sound waves in all directions equally, independent of frequency. Any object radiating sound, including a loudspeaker system, can be thought of as being composed of combinations of such simple point sources. The radiation pattern of a combination of point sources is not the same as for a single source, but depends on the distance and orientation between the sources, the position relative to them from which the listener hears the combination, and the frequency of the sound involved. Using geometry and calculus, some simple combinations of sources are easily solved; others are not. One simple combination is two simple sources separated by a distance and vibrating out of phase, one miniature sphere expanding while the other is contracting. The pair is known as a doublet, or dipole, and the radiation of this combination is similar to that of a very small dynamic loudspeaker operating without a baffle. The directivity of a dipole is a figure 8 shape with maximum output along a vector that connects the two sources and minimums to the sides when the observing point is equidistant from the two sources, where the sum of the positive and negative waves cancel each other. While most drivers are dipoles, depending on the enclosure to which they are attached, they may radiate as monopoles, dipoles (or bipoles). If mounted on a finite baffle, and these out of phase waves are allowed to interact, dipole peaks and nulls in the frequency response result. When the rear radiation is absorbed or trapped in a box, the diaphragm becomes a monopole radiator. Bipolar speakers, made by mounting in-phase monopoles (both moving out of or into the box in unison) on opposite sides of a box, are a method of approaching omnidirectional radiation patterns. is the Bessel function of the first kind. A planar source radiates sound uniformly for low frequencies' wavelengths longer than the dimensions of the planar source, and as frequency increases, the sound from such a source focuses into an increasingly narrower angle. The smaller the driver, the higher the frequency where this narrowing of directivity occurs. Even if the diaphragm is not perfectly circular, this effect occurs such that larger sources are more directive. Several loudspeaker designs approximate this behavior. Most are electrostatic or planar magnetic designs. Various manufacturers use different driver mounting arrangements to create a specific type of sound field in the space for which they are designed. The resulting radiation patterns may be intended to more closely simulate the way sound is produced by real instruments, or simply create a controlled energy distribution from the input signal (some using this approach are called monitors, as they are useful in checking the signal just recorded in a studio). An example of the first is a room corner system with many small drivers on the surface of a 1/8 sphere. A system design of this type was patented and produced commercially by Professor Amar Bose—the 2201. 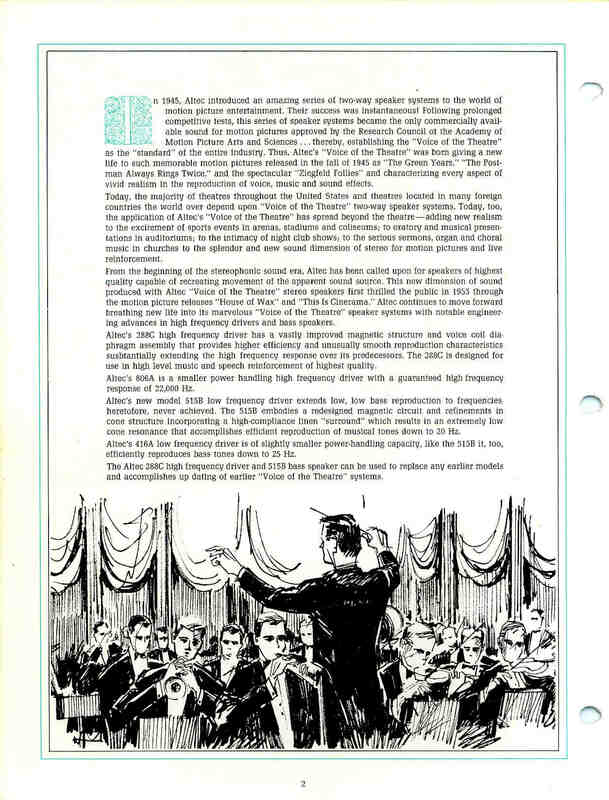 Later Bose models have deliberately emphasized production of both direct and reflected sound by the loudspeaker itself, regardless of its environment. The designs are controversial in high fidelity circles, but have proven commercially successful. Several other manufacturers' designs follow similar principles. Directivity is an important issue because it affects the frequency balance of sound a listener hears, and also the interaction of the speaker system with the room and its contents. A very directive (sometimes termed 'beamy') speaker (i.e., on an axis perpendicular to the speaker face) may result in a reverberant field lacking in high frequencies, giving the impression the speaker is deficient in treble even though it measures well on axis (e.g., "flat" across the entire frequency range). Speakers with very wide, or rapidly increasing directivity at high frequencies, can give the impression that there is too much treble (if the listener is on axis) or too little (if the listener is off axis). This is part of the reason why on-axis frequency response measurement is not a complete characterization of the sound of a given loudspeaker. 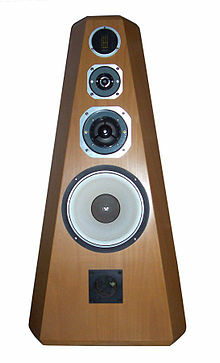 While dynamic cone speakers remain the most popular choice, many other speaker technologies exist. The moving iron speaker was the first type of speaker that was invented. Unlike the newer dynamic (moving coil) design, a moving-iron speaker uses a stationary coil to vibrate a magnetized piece of metal (called the iron, reed, or armature). The metal is either attached to the diaphragm or is the diaphragm itself. This design was the original loudspeaker design, dating back to the early telephone. Moving iron drivers are inefficient and can only produce a small band of sound. They require large magnets and coils to increase force. Balanced armature drivers (a type of moving iron driver) use an armature that moves like a see-saw or diving board. Since they are not damped, they are highly efficient, but they also produce strong resonances. They are still used today for high end earphones and hearing aids, where small size and high efficiency are important. A piezoelectric buzzer. 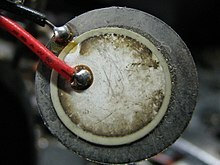 The white ceramic piezoelectric material can be seen fixed to a metal diaphragm. Piezoelectric speakers are frequently used as beepers in watches and other electronic devices, and are sometimes used as tweeters in less-expensive speaker systems, such as computer speakers and portable radios. Piezoelectric speakers have several advantages over conventional loudspeakers: they are resistant to overloads that would normally destroy most high frequency drivers, and they can be used without a crossover due to their electrical properties. There are also disadvantages: some amplifiers can oscillate when driving capacitive loads like most piezoelectrics, which results in distortion or damage to the amplifier. Additionally, their frequency response, in most cases, is inferior to that of other technologies. This is why they are generally used in single frequency (beeper) or non-critical applications. Piezoelectric speakers can have extended high frequency output, and this is useful in some specialized circumstances; for instance, sonar applications in which piezoelectric variants are used as both output devices (generating underwater sound) and as input devices (acting as the sensing components of underwater microphones). They have advantages in these applications, not the least of which is simple and solid state construction that resists seawater better than a ribbon or cone based device would. In 2013, Kyocera introduced piezoelectric ultra-thin medium-size film speakers with only 1 millimeter of thickness and 7 grams of weight for their 55" OLED televisions and they hope the speakers will also be used in PCs and tablets. Besides medium-size, there are also large and small sizes which can all produce relatively the same quality of sound and volume within 180 degrees. The highly responsive speaker material provides better clarity than traditional TV speakers. Instead of a voice coil driving a speaker cone, a magnetostatic speaker uses an array of metal strips bonded to a large film membrane. The magnetic field produced by signal current flowing through the strips interacts with the field of permanent bar magnets mounted behind them. The force produced moves the membrane and so the air in front of it. Typically, these designs are less efficient than conventional moving-coil speakers. Magnetostrictive transducers, based on magnetostriction, have been predominantly used as sonar ultrasonic sound wave radiators, but their use has spread also to audio speaker systems. 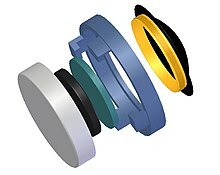 Magnetostrictive speaker drivers have some special advantages: they can provide greater force (with smaller excursions) than other technologies; low excursion can avoid distortions from large excursion as in other designs; the magnetizing coil is stationary and therefore more easily cooled; they are robust because delicate suspensions and voice coils are not required. Magnetostrictive speaker modules have been produced by Fostex and FeONIC and subwoofer drivers have also been produced. Schematic showing an electrostatic speaker's construction and its connections. The thickness of the diaphragm and grids has been exaggerated for the purpose of illustration. Electrostatic loudspeakers use a high voltage electric field (rather than a magnetic field) to drive a thin statically charged membrane. Because they are driven over the entire membrane surface rather than from a small voice coil, they ordinarily provide a more linear and lower-distortion motion than dynamic drivers. They also have a relatively narrow dispersion pattern that can make for precise sound-field positioning. However, their optimum listening area is small and they are not very efficient speakers. They have the disadvantage that the diaphragm excursion is severely limited because of practical construction limitations—the further apart the stators are positioned, the higher the voltage must be to achieve acceptable efficiency. This increases the tendency for electrical arcs as well as increasing the speaker's attraction of dust particles. Arcing remains a potential problem with current technologies, especially when the panels are allowed to collect dust or dirt and are driven with high signal levels. Electrostatics are inherently dipole radiators and due to the thin flexible membrane are less suited for use in enclosures to reduce low frequency cancellation as with common cone drivers. Due to this and the low excursion capability, full range electrostatic loudspeakers are large by nature, and the bass rolls off at a frequency corresponding to a quarter wavelength of the narrowest panel dimension. To reduce the size of commercial products, they are sometimes used as a high frequency driver in combination with a conventional dynamic driver that handles the bass frequencies effectively. Electrostatics are usually driven through a step-up transformer that multiplies the voltage swings produced by the power amplifier. This transformer also multiplies the capacitive load that is inherent in electrostatic transducers, which means the effective impedance presented to the power amplifiers varies widely by frequency. A speaker that is nominally 8 ohms may actually present a load of 1 ohm at higher frequencies, which is challenging to some amplifier designs. A ribbon speaker consists of a thin metal-film ribbon suspended in a magnetic field. The electrical signal is applied to the ribbon, which moves with it to create the sound. The advantage of a ribbon driver is that the ribbon has very little mass; thus, it can accelerate very quickly, yielding very good high-frequency response. Ribbon loudspeakers are often very fragile—some can be torn by a strong gust of air. Most ribbon tweeters emit sound in a dipole pattern. A few have backings that limit the dipole radiation pattern. Above and below the ends of the more or less rectangular ribbon, there is less audible output due to phase cancellation, but the precise amount of directivity depends on ribbon length. Ribbon designs generally require exceptionally powerful magnets, which makes them costly to manufacture. Ribbons have a very low resistance that most amplifiers cannot drive directly. As a result, a step down transformer is typically used to increase the current through the ribbon. The amplifier "sees" a load that is the ribbon's resistance times the transformer turns ratio squared. The transformer must be carefully designed so that its frequency response and parasitic losses do not degrade the sound, further increasing cost and complication relative to conventional designs. Planar magnetic speakers (having printed or embedded conductors on a flat diaphragm) are sometimes described as ribbons, but are not truly ribbon speakers. The term planar is generally reserved for speakers with roughly rectangular flat surfaces that radiate in a bipolar (i.e., front and back) manner. Planar magnetic speakers consist of a flexible membrane with a voice coil printed or mounted on it. The current flowing through the coil interacts with the magnetic field of carefully placed magnets on either side of the diaphragm, causing the membrane to vibrate more or less uniformly and without much bending or wrinkling. The driving force covers a large percentage of the membrane surface and reduces resonance problems inherent in coil-driven flat diaphragms. Bending wave transducers use a diaphragm that is intentionally flexible. The rigidity of the material increases from the center to the outside. Short wavelengths radiate primarily from the inner area, while longer waves reach the edge of the speaker. To prevent reflections from the outside back into the center, long waves are absorbed by a surrounding damper. Such transducers can cover a wide frequency range (80 Hz to 35,000 Hz) and have been promoted as being close to an ideal point sound source. This uncommon approach is being taken by only a very few manufacturers, in very different arrangements. 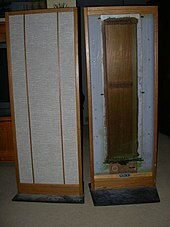 The Ohm Walsh loudspeakers use a unique driver designed by Lincoln Walsh, who had been a radar development engineer in WWII. He became interested in audio equipment design and his last project was a unique, one-way speaker using a single driver. The cone faced down into a sealed, airtight enclosure. Rather than move back-and-forth as conventional speakers do, the cone rippled and created sound in a manner known in RF electronics as a "transmission line". The new speaker created a cylindrical sound field. Lincoln Walsh died before his speaker was released to the public. The Ohm Acoustics firm has produced several loudspeaker models using the Walsh driver design since then. German Physiks, an audio equipment firm in Germany, also produces speakers using this approach. The German firm, Manger, has designed and produced a bending wave driver that at first glance appears conventional. In fact, the round panel attached to the voice coil bends in a carefully controlled way to produce full range sound. Josef W. Manger was awarded with the "Diesel Medal" for extraordinary developments and inventions by the German institute of inventions. There have been many attempts to reduce the size of speaker systems, or alternatively to make them less obvious. One such attempt was the development of "exciter" transducer coils mounted to flat panels to act as sound sources, most accurately called exciter/panel drivers. These can then be made in a neutral color and hung on walls where they are less noticeable than many speakers, or can be deliberately painted with patterns, in which case they can function decoratively. There are two related problems with flat panel techniques: first, a flat panel is necessarily more flexible than a cone shape in the same material, and therefore moves as a single unit even less, and second, resonances in the panel are difficult to control, leading to considerable distortions. Some progress has been made using such lightweight, rigid, materials such as Styrofoam, and there have been several flat panel systems commercially produced in recent years. In Heil's air motion transducer, current through the membrane 2 causes it to move left and right in magnetic field 6, moving air in and out along directions 8; barriers 4 prevent air from moving in unintended directions. Oskar Heil invented the air motion transducer in the 1960s. In this approach, a pleated diaphragm is mounted in a magnetic field and forced to close and open under control of a music signal. Air is forced from between the pleats in accordance with the imposed signal, generating sound. The drivers are less fragile than ribbons and considerably more efficient (and able to produce higher absolute output levels) than ribbon, electrostatic, or planar magnetic tweeter designs. ESS, a California manufacturer, licensed the design, employed Heil, and produced a range of speaker systems using his tweeters during the 1970s and 1980s. Lafayette Radio, a large US retail store chain, also sold speaker systems using such tweeters for a time. There are several manufacturers of these drivers (at least two in Germany—one of which produces a range of high-end professional speakers using tweeters and mid-range drivers based on the technology) and the drivers are increasingly used in professional audio. Martin Logan produces several AMT speakers in the US and GoldenEar Technologies incorporates them in its entire speaker line. In 2013, a research team introduced Transparent ionic conduction speaker which a 2 layers transparent conductive gel and a layer of transparent rubber in between to make high voltage and high actuation work to reproduce good sound quality. The speaker is suitable for robotics, mobile computing and adaptive optics fields. Plasma arc loudspeakers use electrical plasma as a radiating element. Since plasma has minimal mass, but is charged and therefore can be manipulated by an electric field, the result is a very linear output at frequencies far higher than the audible range. Problems of maintenance and reliability for this approach tend to make it unsuitable for mass market use. In 1978 Alan E. Hill of the Air Force Weapons Laboratory in Albuquerque, NM, designed the Plasmatronics Hill Type I, a tweeter whose plasma was generated from helium gas. This avoided the ozone and nitrous oxide produced by RF decomposition of air in an earlier generation of plasma tweeters made by the pioneering DuKane Corporation, who produced the Ionovac (marketed as the Ionofane in the UK) during the 1950s. Currently, there remain a few manufacturers in Germany who use this design, and a do-it-yourself design has been published and has been available on the Internet. A less expensive variation on this theme is the use of a flame for the driver, as flames contain ionized (electrically charged) gases. In 2008, researchers of Tsinghua University demonstrated a thermoacoustic loudspeaker of carbon nanotube thin film, whose working mechanism is a thermoacoustic effect. Sound frequency electric currents are used to periodically heat the CNT and thus result in sound generation in the surrounding air. The CNT thin film loudspeaker is transparent, stretchable and flexible. In 2013, researchers of Tsinghua University further present a thermoacoustic earphone of carbon nanotube thin yarn and a thermoacoustic surface-mounted device. They are both fully integrated devices and compatible with Si-based semiconducting technology. A rotary woofer is essentially a fan with blades that constantly change their pitch, allowing them to easily push the air back and forth. Rotary woofers are able to efficiently reproduce infrasound frequencies, which are difficult to impossible to achieve on a traditional speaker with a diaphragm. They are often employed in movie theaters to recreate rumbling bass effects, such as explosions. Digital speakers have been the subject of experiments performed by Bell Labs as far back as the 1920s. The design is simple; each bit controls a driver, which is either fully 'on' or 'off'. Problems with this design have led manufacturers to abandon it as impractical for the present. First, for a reasonable number of bits (required for adequate sound reproduction quality), the physical size of a speaker system becomes very large. Secondly, due to inherent analog digital conversion problems, the effect of aliasing is unavoidable, so that the audio output is "reflected" at equal amplitude in the frequency domain, on the other side of the Nyquist limit (half the sampling frequency), causing an unacceptably high level of ultrasonics to accompany the desired output. No workable scheme has been found to adequately deal with this. The term "digital" or "digital-ready" is often used for marketing purposes on speakers or headphones, but these systems are not digital in the sense described above. Rather, they are conventional speakers that can be used with digital sound sources (e.g., optical media, MP3 players, etc. ), as can any conventional speaker. ^ Ballou, Glen (2013). Handbook for Sound Engineers, 4th Ed (in French). Taylor and Francis. p. 597. ISBN 978-1136122538. ^ Talbot-Smith, Michael (2013). Audio Engineer's Reference Book. CRC Press. p. 2.52. ISBN 978-1136119743. ^ "The Forgotten Johann Philipp Reis". Integrated Network Cables. Retrieved 2015-06-11. ^ "Loudspeaker History". Archived from the original on September 5, 2006. Retrieved 2007-02-21. ^ "Jensen History". Archived from the original on May 9, 2008. Retrieved 2009-02-03. ^ J. Eargle and M. Gander (2004). "Historical Perspectives and Technology Overview of Loudspeakers for Sound Reinforcemen" (PDF). Journal of the Audio Engineering Society. 52 (4): 412–432 (p. 416). ^ "Walter Schottky". Archived from the original on 2009-10-25. ^ Spanias, Andreas; Ted Painter; Venkatraman Atti (2007). Audio Signal Processing and Coding. Wiley-Interscience. ISBN 978-0-470-04196-3. ^ Bozak, R.T., Electronics magazine, June 1940. ^ Audioheritage.org. Biography of John Hilliard, Retrieved on May 6, 2009. ^ Rumsey, Francis; McCormick, Tim (2009). Sound and recording (6th ed.). Oxford, UK: Focal Press. p. 81. ISBN 978-0-240-52163-3. ^ Davis, Don; Carolyn Davis (1997). "Loudspeakers and Loudspeaker Arrays". Sound System Engineering (2 ed.). Focal Press. p. 350. ISBN 978-0-240-80305-0. Retrieved March 30, 2010. We often give lip service to the fact that audio allows its practitioners to engage in both art and science. ^ Fremer, Michael (April 2004). 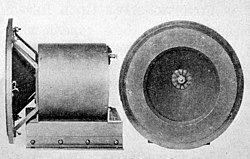 "Aerial Model 20T loudspeaker". Stereophile. Retrieved March 30, 2010. ^ Fantel, Hans (June 6, 1993). "Speaker Design Goes Modern". The New York Times. Retrieved March 30, 2010. ^ "Kvart & Bølge - Audiophile Quarter-Wave Full-Range Speakers -". Kvart & Bølge - Audiophile Quarter-Wave Full-Range Speakers -. Retrieved 14 April 2018. ^ "Top 10 Entertainment". AskMen. Retrieved 14 April 2018. 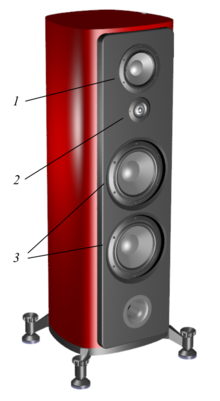 ^ Home Speakers Glossary. Crutchfield.com (2010-06-21). Retrieved on 2010-10-12. ^ Young, Tom (December 1, 2008). "In-Depth: The Aux-Fed Subwoofer Technique Explained". Study Hall. ProSoundWeb. p. 2. Archived from the original on January 14, 2010. Retrieved March 3, 2010. ^ DellaSala, Gene (August 29, 2004). "Setting the Subwoofer / LFE Crossover for Best Performance". Tips & Tricks: Get Good Bass. Audioholics. Retrieved March 3, 2010. ^ "Glossary of Terms". Home Theater Design. ETS-eTech. p. 1. Archived from the original on July 23, 2012. Retrieved March 3, 2010. ^ Nieuwendijk, Joris A. (1988) "Compact Ribbon Tweeter/Midrange Loudspeaker." Audio Engineering Society. ^ "Genelec 8260A Technical Paper" (PDF). Genelec. September 2009. pp. 3–4. Retrieved 24 September 2009. ^ a b c Elliott Sound Products. Rod Elliott, 2004. Active Vs. Passive Crossovers. Retrieved on June 16, 2009. ^ Boston Acoustic Society. The B.A.S. Speaker, September 1978. Peter W. Mitchell: "The D-23 crossover can be used for bi-amping, tri-amping, or even quad-amping." ^ EAW KF300/600 Series — Compact three-way VAT Systems Archived 2012-04-24 at the Wayback Machine. Three-way loudspeakers switchable between bi-amped and other modes. ^ Yorkville U215 Speaker – 1600w 2x15 / 3x5 inch / 1 inch Archived 2012-03-22 at the Wayback Machine. Three-way loudspeaker switchable between bi-amped and fully passive modes. ^ a b Elliott Sound Products. Rod Elliott, 2004. Design of Passive Crossovers. Retrieved on June 16, 2009. ^ Q. Sound On Sound, June 2004. What's the difference between ported and un-ported monitors? Chisholm, Hugh, ed. (1911). "Trumpet, Speaking and Hearing" . Encyclopædia Britannica (11th ed.). Cambridge University Press. ^ Davis, Gary; Davis, Gary D. (14 April 1989). The Sound Reinforcement Handbook. Hal Leonard Corporation. ISBN 9780881889000. Retrieved 14 April 2018 – via Google Books. ^ White, Glenn D.; Louie, Gary J. (1 October 2011). The Audio Dictionary: Third Edition, Revised and Expanded. University of Washington Press. ISBN 9780295801704. Retrieved 14 April 2018 – via Google Books. ^ Alten, Stanley R. (22 January 2013). Audio in Media. Cengage Learning. ISBN 9781285675299. Retrieved 14 April 2018 – via Google Books. ^ Eiche, Jon F. (14 April 1990). Guide to Sound Systems for Worship. Hal Leonard Corporation. ISBN 9780793500291. Retrieved 14 April 2018 – via Google Books. ^ EIA RS-278-B "Mounting Dimensions for Loudspeakers"
^ Elliott Sound Products. Rod Elliott, 2006. Speaker Damage Retrieved on June 16, 2009. ^ Elliott Sound Products. Rod Elliott, 2006. Why Do Tweeters Blow When Amplifiers Distort? Retrieved on June 16, 2009. ^ EIA RS-299 "Loudspeakers, Dynamic; Magnetic Structures and Impedance"
^ Audio, NTi. "Equipment used for speaker, driver & cabinet testing". www.nti-audio.com. ^ Engineer, John L. Murphy, Physicist/Audio. "TA Speaker Topics: Loudspeaker Design Tradeoffs". www.trueaudio.com. Retrieved 14 April 2018. ^ "Sensitivity and Hoffman's Iron Law, or "why you can't have your cake and eat it too" – Audioblog". www.salksound.com. Retrieved 14 April 2018. ^ Polar pattern File: Speaker is a Bosch 36 watt LA1-UW36-x columnar model Archived 2008-09-18 at the Wayback Machine with four identical 4-inch drivers arranged vertically in an enclosure 841 mm (33.1 in)ch) high. Polar prediction software is CLF viewer. Loudspeaker information was gathered by the manufacturer into a CF2 file. ^ "The Moving-Iron Speaker". vias.org. ^ Hertsens, Tyll (2014-12-16). "How Balanced Armature Receivers/Drivers Work". innerfidelity. ^ "Kyocera piezoelectric film speaker delivers 180-degree sound to thin TVs and tablets (update: live photos)". August 29, 2013. ^ Yamada, Takeyoshi (November 2005). "Fostex Prototypes Tabletop Vibration Speaker System Using Super Magnetostrictor". Tech-On!. Retrieved 2009-10-05. The cone-shaped speaker system is 95 mm in diameter and 90 mm high. It features an actuator using a magnetostrictor that extends and shrinks in line with magnetic field changes. The actuator converts input sound into the vibration and conveys it to the tabletop thus rendering sound. ^ Onohara, Hirofumi (November 2006). "(WO/2006/118205) GIANT-MAGNETOSTRICTIVE SPEAKER". World Intellectual Property Organization. Archived from the original on 2012-08-05. Retrieved 2009-10-05. A giant-magnetostrictive speaker exhibiting good acoustic characteristics when it is used while being placed on a horizontal surface. ^ "FeONIC D2 Audio Drive" (PDF). FeONIC. p. 1. Archived from the original (PDF) on 2009-12-29. Retrieved 2009-10-05. The D2 is unlike traditional speaker technology because it uses a very high powered magnetostrictive smart material as the driver instead of a moving coil. The material was originally developed by the US military for sonar applications and is now de-restricted for commercial use. ^ Tibu, Florin. "Terfenol-D: No Speakers = Great Sound!". Softpedia. Retrieved 2009-10-05. ^ "MINDCo launches FeONIC Invisible & Green audio". Economic Zones World. January 2010. ^ Manger, Josef W. "Acoustical Reality". ^ "Transparent gel speaker plays music through the magic of ionic conduction (video)". August 30, 2013. ^ a b Hill Plasmatronics described. Retrieved March 26, 2007. ^ "Re: COULD YOU PLEASE FIND RESEARCH RE:SOUND REPRODUTION VIA GAS FLAME & ELECTRI". www.madsci.org. Retrieved 14 April 2018. ^ Xiao, Lin; Kaili Jiang (2008). "Flexible, Stretchable, Transparent Carbon Nanotube Thin Film Loudspeakers". Nano Letters. 8 (12): 4539–4545. doi:10.1021/nl802750z. PMID 19367976. ^ Wei, Yang; Xiaoyang Lin (2013). "Thermoacoustic Chips with Carbon Nanotube Thin Yarn Arrays". Nano Letters. 13 (10): 4795–801. doi:10.1021/nl402408j. PMID 24041369. ^ "Eminent Technology TRW-17 Subwoofer Part I: The Only Subwoofer". International Audio/Video Review. ^ Guttenberg, Steve. "World's most amazing subwoofer has no woofer". Cnet. Look up loudspeaker in Wiktionary, the free dictionary.